This Kestrel does it all. Measure every environmental condition plus wind direction, automatic crosswind, headwind/tailwind. Store the information along with all the other environmental readings in its 1400 data point memory. Pair the 4500 with the Kestrel Vane Mount and you have a data-logging weather station that sets up in seconds and rotates in the slightest of breezes. Did we mention that the whole kit is the ultimate in portability? It packs down into a 2 x 6 inch pouch and weighs under 8 ounces. 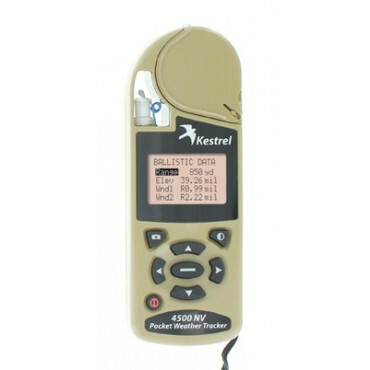 Note: When purchasing this Kestrel you have the option to add a night-vision preserving backlight which helps users to sustain natural night vision. The NV’s backlight incorporates an optical filter to reduce overall brightness and minimize blue and green spectrum light to preserve night vision. Additionally, NV backlights are also much dimmer than a standard backlight, making it more difficult to detect with the naked eye in night operations. This backlight appears soft greyish pink, not red, and is still in the visible spectrum, so is not compatible with night-vision equipment.